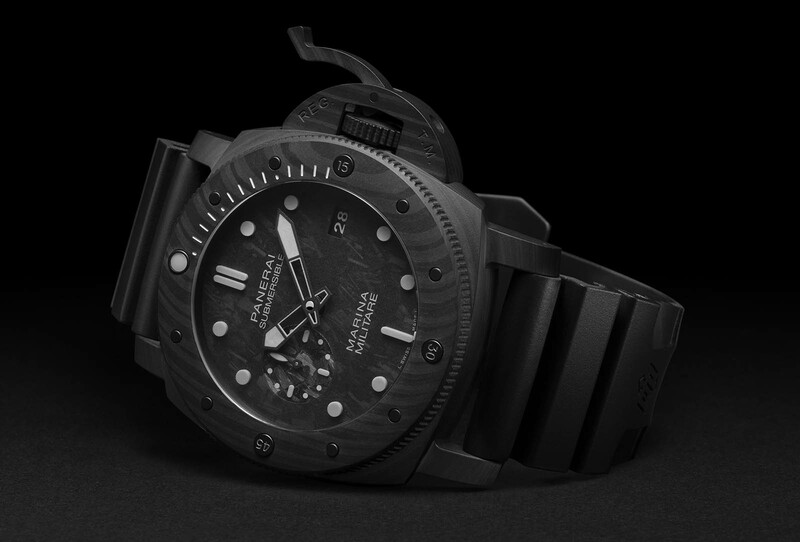 Panerai’s SIHH line-up is focused on the Submersible, the brand’s signature dive watch with a rotating bezel. 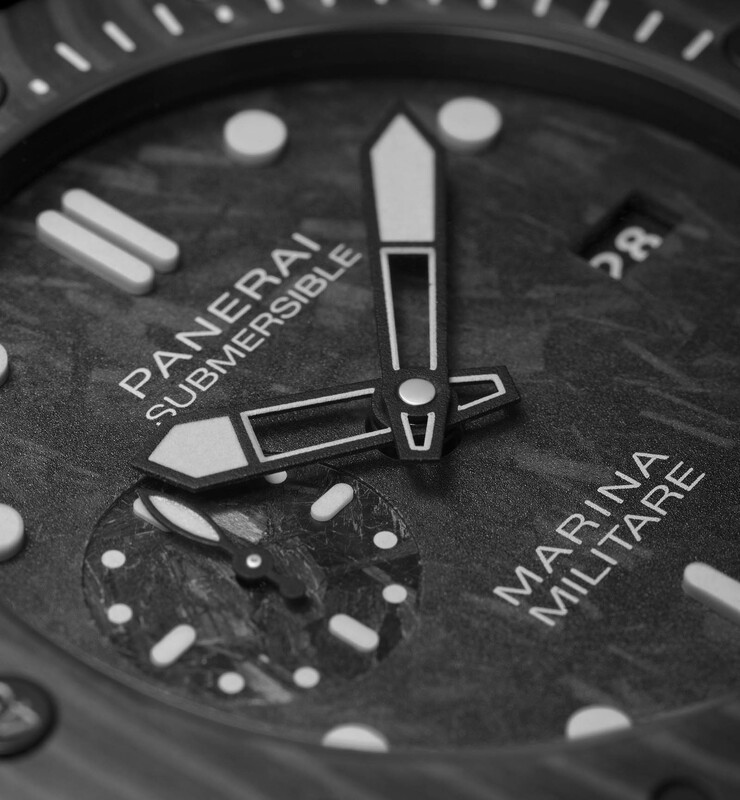 This year the Submersible has been redesigned, and bestowed with the “Marina Militare” label, which refers to the Italian navy, a nod to Panerai’s historical relationship with the navy’s special forces. 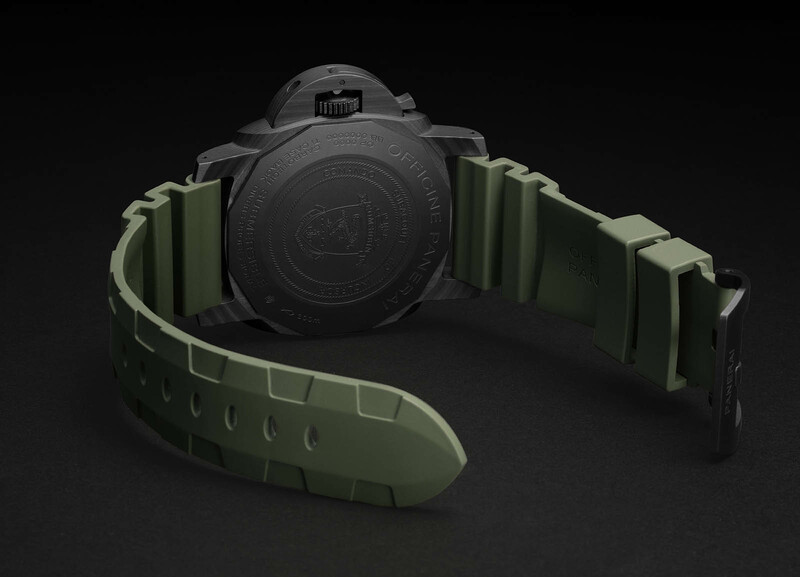 That would be pointless and incongruous, since the Submersible design is a modern creation, except for the fact that the Submersible PAM00961 is accompanied by with a training session with COMSUBIN, the commando frogmen of the Italian navy. Those desiring training in subzero temperatures can instead go for the Submersible Mike Horn that includes a stint in the Arctic. Two Submersible models are being launched this year (including the COMSUBIN experience watch). Both are 47mm in diameter and rated to 300m, with the watch case, bezel and crown lever bridge made from Carbotech. It’s a carbon composite produced with thin sheets of carbon fibres compressed at high pressure with a high-end polymer (PEEK), which binds the composite material making it stronger and more durable. The layered carbon fibre sheets results in a distinctive striped pattern. While the case is carbon composite, the caseback is in titanium as carbon fibre do not fare well under torsional forces. The movement inside is the P.9010, a self-winding movement with a date at three, and a three-day power reserve. 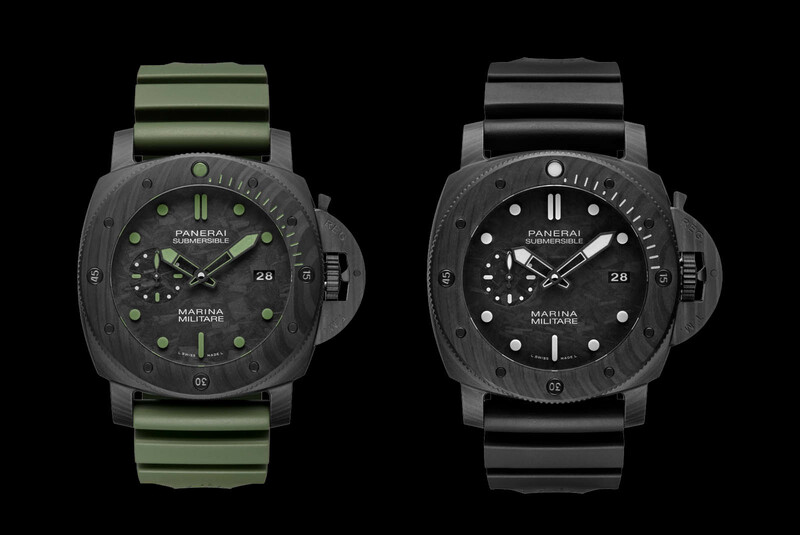 Both models also feature a carbon dial with a black camouflage pattern. The regular production model is the Submersible Marina Militare Carbotech 47mm PAM00979, which has white Super-Luminova on the dial and hands. 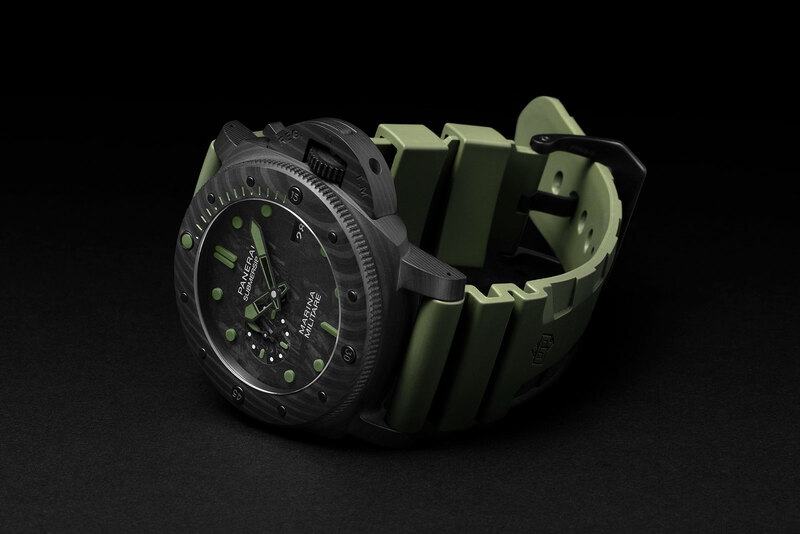 Double the price of the standard model is the 33-piece Submersible Marina Militare Carbotech 47mm PAM00961, which is distinguished by its olive green Super-Luminova. Its hefty retail price includes a dive training session with COMSUBIN, short for Comando Raggruppamento Subacquei e Incursori Teseo Tesei. This has the COMSUBIN logo engraved on the case back. 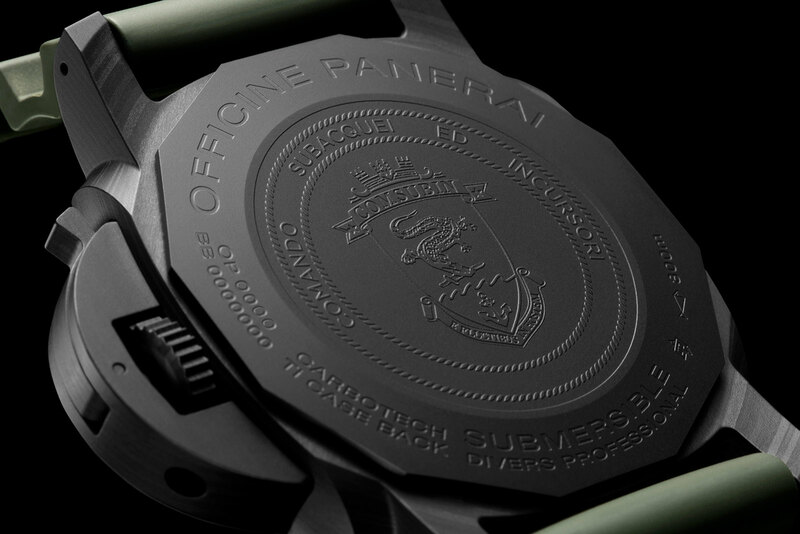 The Panerai Submersible Marina Militare Carbotech 47mm PAM00979 is priced at US$19,900. 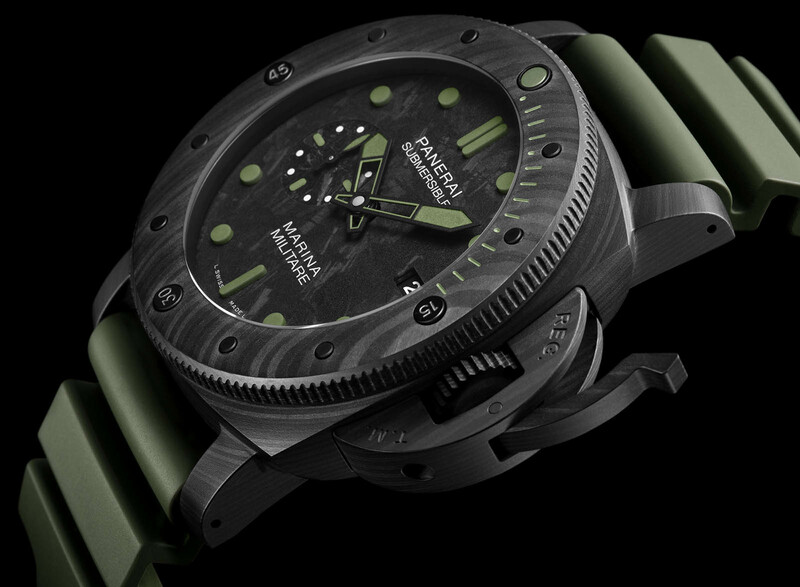 The Panerai Submersible Marina Militare Carbotech 47mm PAM00961 is a limited edition of 33 pieces, priced at US$39,900.